Choosing a color for a room is the first step before decorating. After that, we can decide what ornaments or furniture that matches the shade. And gray is one of the trending colors nowadays. Besides being included in neutral colors, gray can make each ornament take their own stage. You also can combine this shade with many styles, especially for a minimalist look. 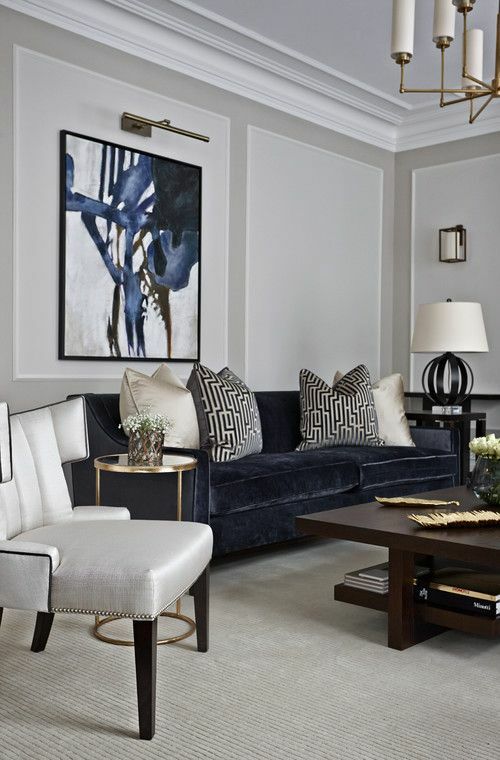 To build your dream space, try these six gray living room ideas. Find the best ideas that fit your desire! To capture a minimalist look, just go simple and classic. Don’t overdo it by selecting the decor patterns or colors. Simply pick warm colors that can support the gray room. In the picture above, for example, you can put a dark blue and warm gray couch. Then choose cushions with warm shades and classic patterns. That simplicity will make all elements in the room look good together. 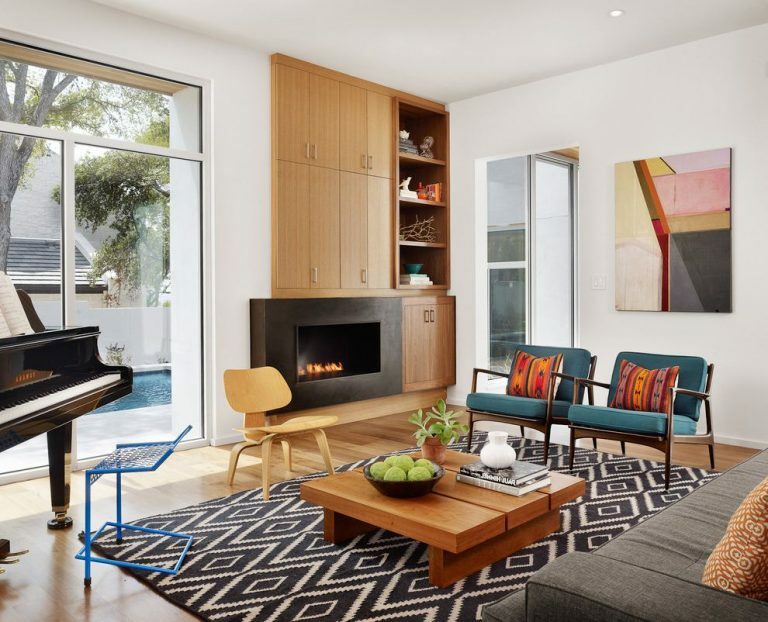 Even though your main goal is to highlight the minimalist impression, you still need some accents that can spice up space. The trick is giving an accent on the wall so that the living room atmosphere is not monotonous. Hanging a big artwork on the wall and install unique shaped sconces. Also, the presence of a pot light and table lamp can support the lighting scheme. 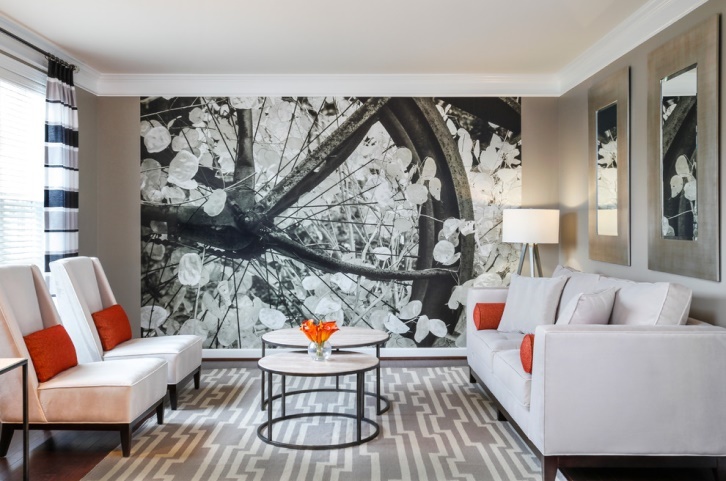 Go art with your wall! 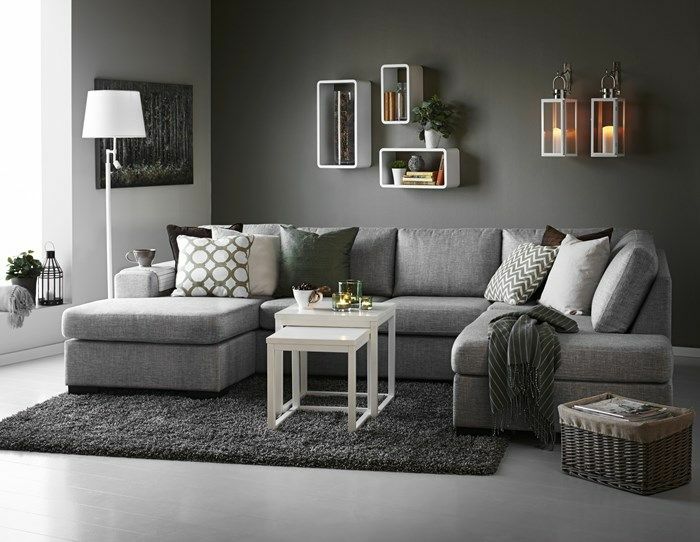 Gray will not make your living room feel gloomy and depressing. Conversely, the hue can give a bright and sophisticated effect if it’s given the right touch. The first trick is to give some focal points in your gray space. Hang a painting on the wall and choose the large one. In the ceiling, install a pot light to highlight the artwork then. As in the picture, you can also put an arc floor lamp next to the couch. 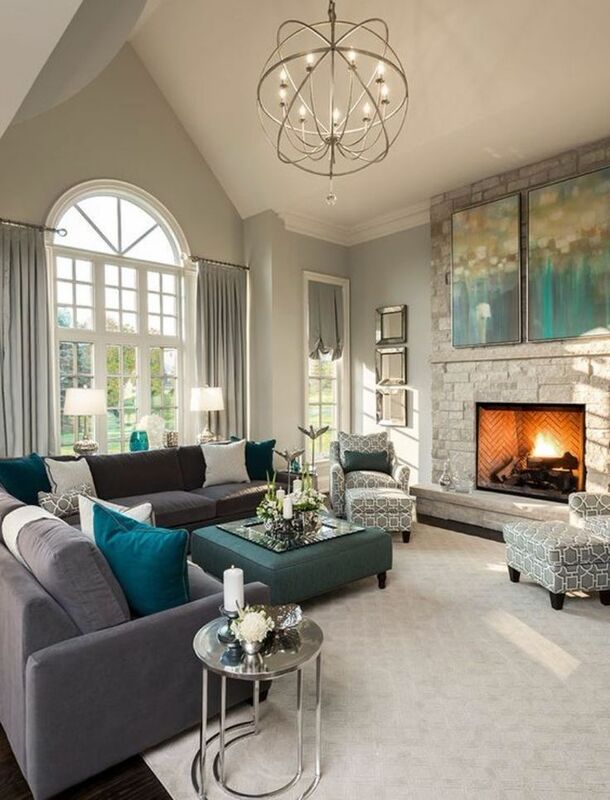 The lamp color should be contrasted with the couch and room theme. That ornament will be another focal point; besides the big paintings you display. Decorating a room is about how creative you are. So, don’t be afraid to experiment. For example, try to show a unique twist in your gray space. Floral print can be a sweet twist to bring optimism and cheerful mood to the living room. This accent also works very well with gray. You can put some floral elements in the room, like placing a floral printed couch and cushions. And if you want to feature the floral print as the center of attention, you should choose a deep gray backdrop. On the wall, just hang a beautiful flower painting to add the dynamic mood in the living room. Also, choose darker flooring to make the floral accessories bring to light. As you know, gray is a neutral color. So, you can combine it with various colors, including the bright one. Orange is one of the right colors to revive your gray room. Just inject a shot of orange to brighten up your living room. Referring to the picture above, your room must be dominated by deep gray to support orange. Dark backdrop also can bring out the brightest side from orange and make it take center stage. Add a rug with a combination of warm gray and orange. Then pick a chair with a similar color pattern. 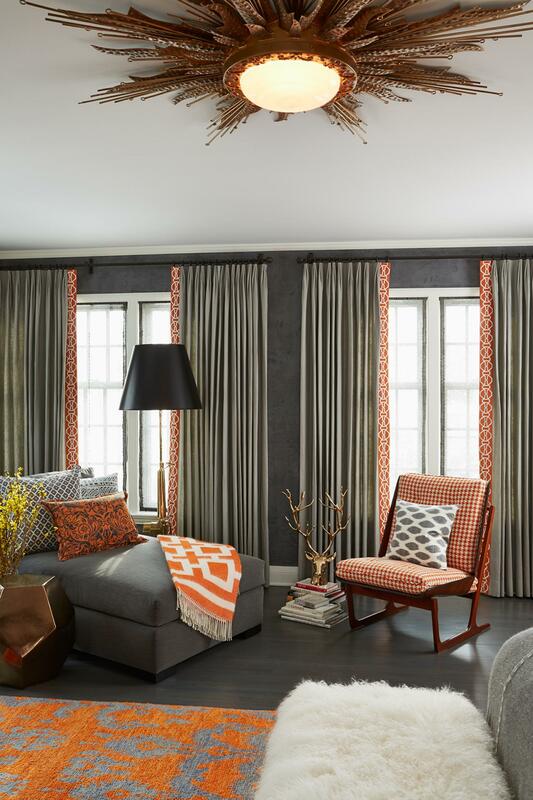 For a window treatment, choose gray curtain with a unique orange pattern. Plus, don’t forget to set an orange floral print cushion. They will surely make your living room stand out. The living room is used as a family gathering place. So, the room must have a soothing and calming atmosphere. As you can see in the picture above, play with the gray color palette is a brilliant idea. You can coordinate the depth of gray to capture the cozy look. Choose some gray color degradation, like misty gray, smoke gray, or trout gray. Make sure that they can fuse into one another. As a visual balancer, give white accents as well. Place a white floor lamp and a few wall selves with the same tone. After all, place a white cocktail table in the center for a contemporary look. 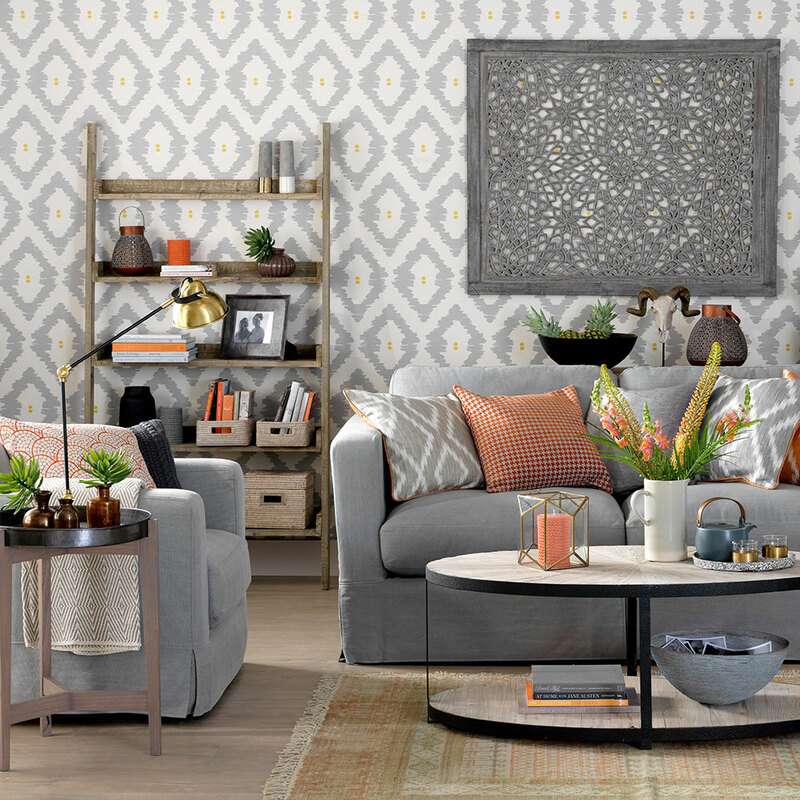 The gray room is very easy to mix with many patterns. Therefore, you are strongly encouraged to play with plenty patterns. Don’t be afraid to look overwhelming, because gray is a neutral color. In the picture, you can see that there are many patterns used to decorate the living room. 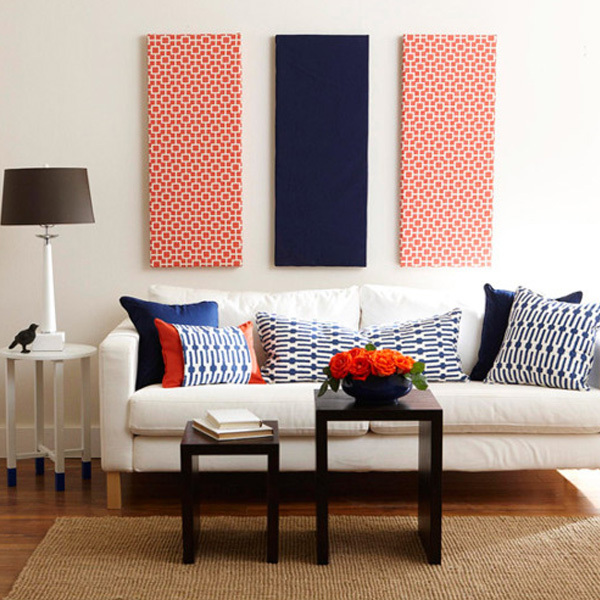 You can install a backdrop with a contrasting pattern with your cushions or tapestry. Besides putting many patterns into the room, the decoration also inserts some hues. For example, you can stick some light colors such as orange, bright yellow, green, and white. They are displayed as complementary ornaments to the furniture. For the couch, you should take up the light gray. It seems trivial, but it can really feature the little ornaments around. The minimalist look is a trend in modern society today. 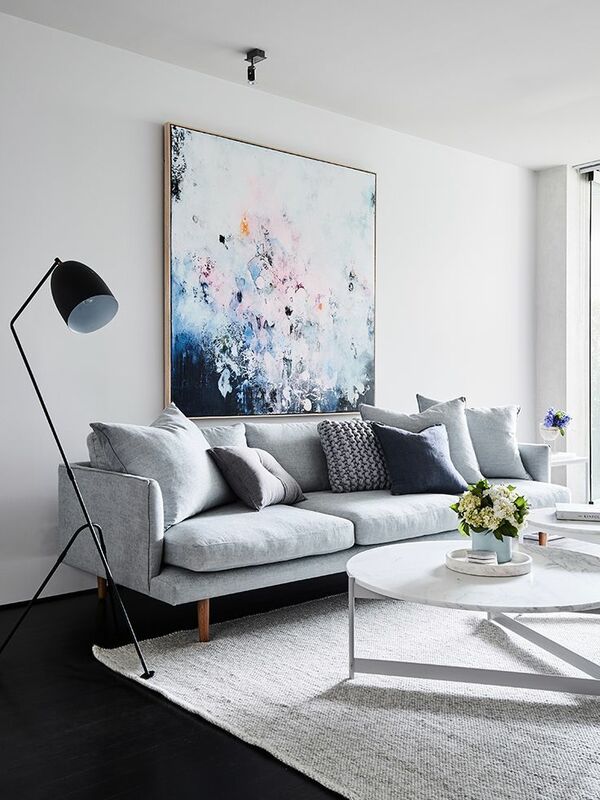 Hopefully, these gray living room ideas can help you to find the best style that suits the real you.